In two to five minutes on a conventional stovetop, cookware coated with Teflon and other non-stick surfaces can exceed temperatures at which the coating breaks apart and emits toxic particles and gases linked to hundreds, perhaps thousands, of pet bird deaths and an unknown number of human illnesses each year, according to tests commissioned by Environmental Working Group (EWG). In new tests conducted by a university food safety professor, a generic non-stick frying pan preheated on a conventional, electric stovetop burner reached 736°F in three minutes and 20 seconds, with temperatures still rising when the tests were terminated. A Teflon pan reached 721°F in just five minutes under the same test conditions (See Figure 1), as measured by a commercially available infrared thermometer. 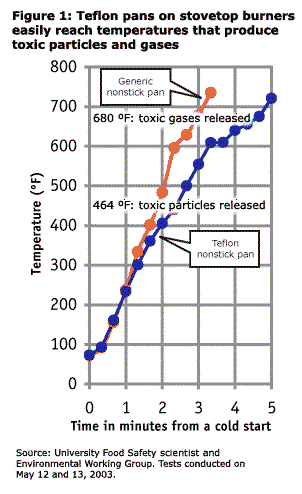 DuPont studies show that the Teflon off-gases toxic particulates at 446°F. 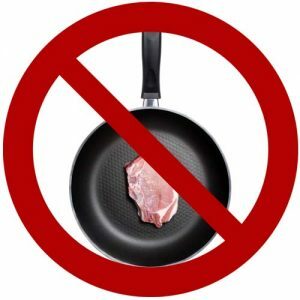 At 680°F Teflon pans release at least six toxic gases, including two carcinogens, two global pollutants, and MFA, a chemical lethal to humans at low doses. At temperatures that DuPont scientists claim are reached on stovetop drip pans (1000°F), non-stick coatings break down to a chemical warfare agent known as PFIB, and a chemical analog of the WWII nerve gas phosgene. These new tests show that cookware exceeds these temperatures and turns toxic through the common act of preheating a pan, on a burner set on high. In cases of “Teflon toxicosis,” as the bird poisonings are called, the lungs of exposed birds hemorrhage and fill with fluid, leading to suffocation. DuPont acknowledges that the fumes can also sicken people, a condition called “polymer fume fever.” DuPont has never studied the incidence of the fever among users of the billions of non-stick pots and pans sold around the world. Neither has the company studied the long-term effects from the sickness, or the extent to which Teflon exposures lead to human illnesses believed erroneously to be the common flu. The government has not assessed the safety of non-stick cookware. According to a Food and Drug Administration (FDA) food safety scientist: “You won’t find a regulation anywhere on the books that specifically addresses cookwares,” although the FDA approved Teflon for contact with food in 1960 based on a food frying study that found higher levels of Teflon chemicals in hamburger cooked on heat-aged and old pans. At the time, FDA judged these levels to be of little health significance. Of the 6.9 million bird-owning households in the US that claim an estimated 19 million pet birds, many don’t know that Teflon poses an acute hazard to birds. Most non-stick cookware carries no warning label. DuPont publicly acknowledges that Teflon can kill birds, but the company-produced public service brochure on bird safety discusses the hazards of ceiling fans, mirrors, toilets, and cats before mentioning the dangers of Teflon fumes. As a result of the new data showing that non-stick surfaces reach toxic temperatures in a matter of minutes, EWG has petitioned the Consumer Product Safety Commission (CPSC) to require that cookware and heated appliances bearing non-stick coatings must carry a label warning of the acute hazard the coating poses to pet birds. Additionally, we recommend that bird owners completely avoid cookware and heated appliances with non-stick coatings. Alternative cookware includes stainless steel, ceramic and cast iron, neither of which off-gases persistent pollutants.